Remember this super easy way to make wreaths using a Dollar Store laundry basket from last year’s tutorial here? 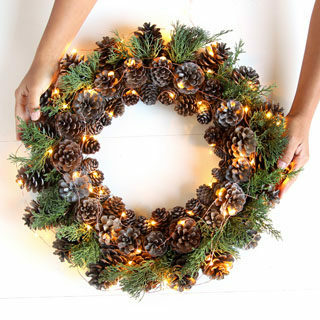 Many wreaths later, I found another great way to make them! 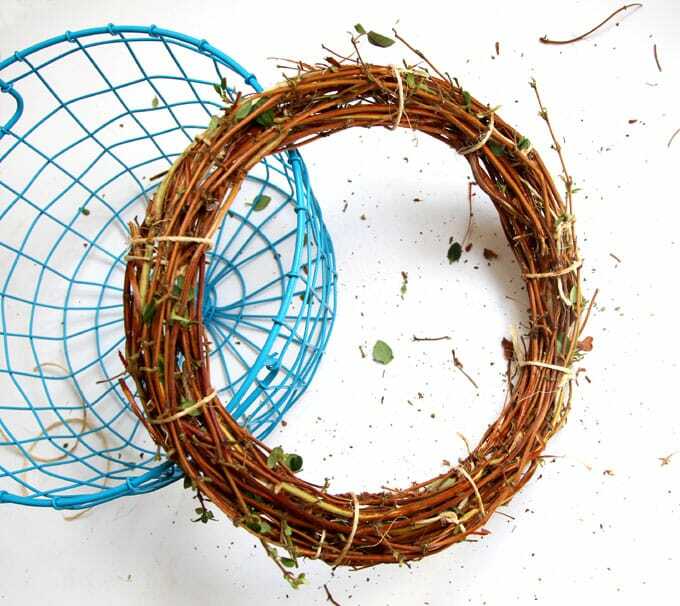 The new method works in a similar way, and it is even better for those wreaths with lots of thick branches, such as honeysuckle vine or grapevine wreaths, which are such great bases for making many other types of wreaths. Does this lovely blue basket look familiar? Hint: those toilet paper roll pumpkins! 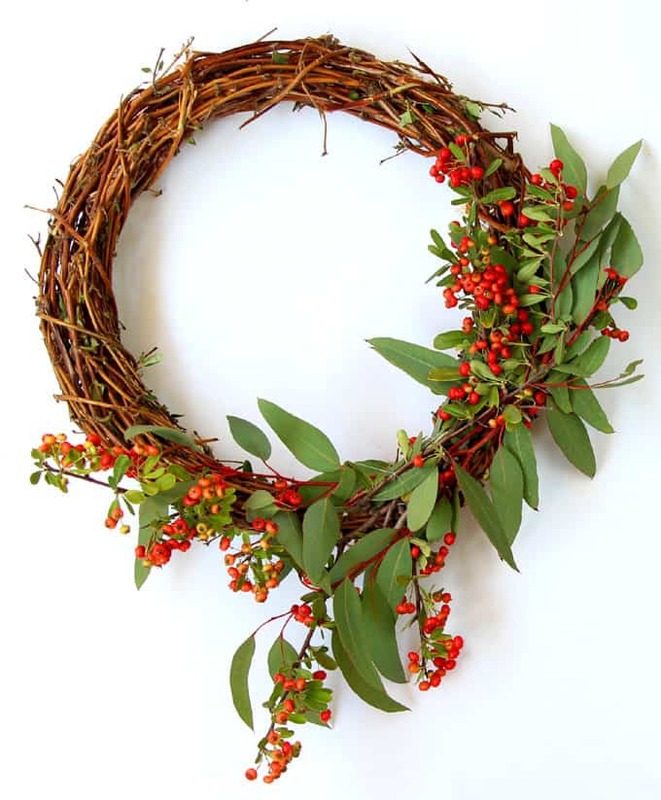 First we will make a vine wreath which can be used over and over to make all kinds of wreaths. 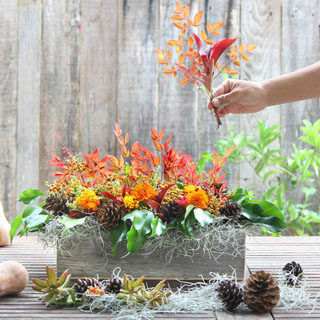 All you have to is adding a couple of sprigs of fresh flowers, berries, etc, and a beautiful wreath is born instantly! 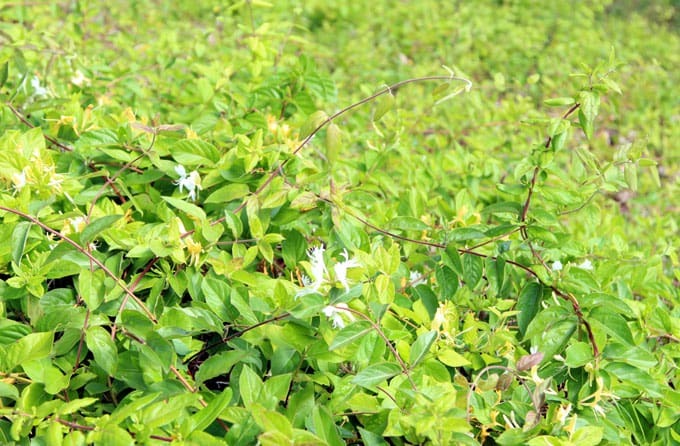 Look at this hillside covered with Honeysuckles! Time to trim some cuttings! 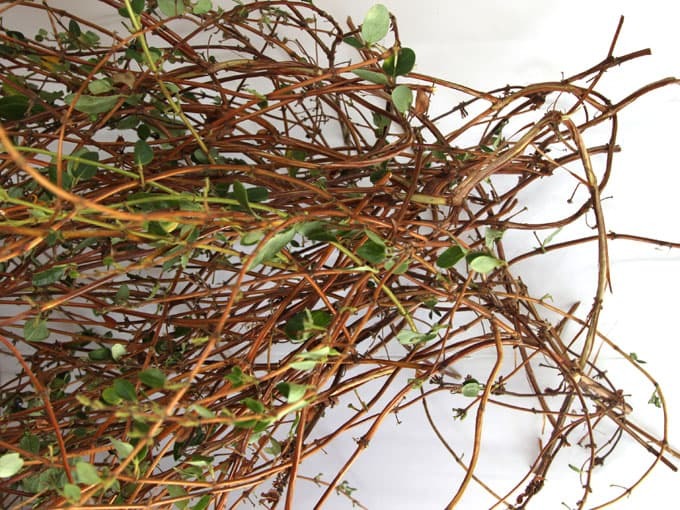 To make a nice vine wreath, you will need about 10 to 15 pieces of 3 foot long cuttings. Clean off the leaves. You can also use grapevines. 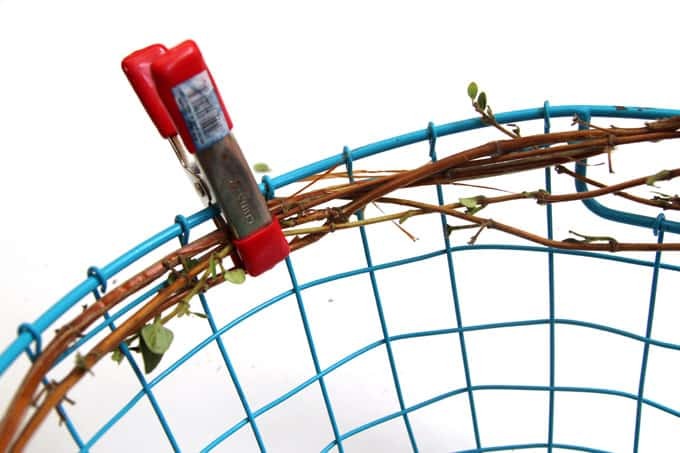 Start by clamping the first piece of vine onto the side of the wire basket using a spring clamp . 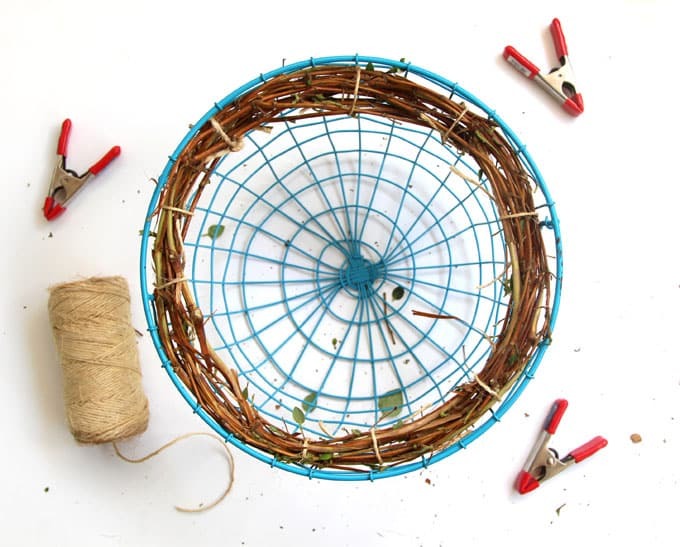 Bend the side branches and keep shaping them along the inside of the basket. 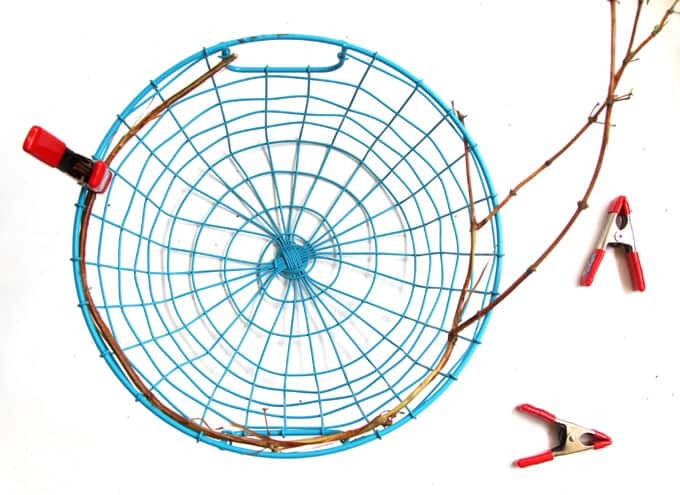 The round wire basket holds the form of the wreath. 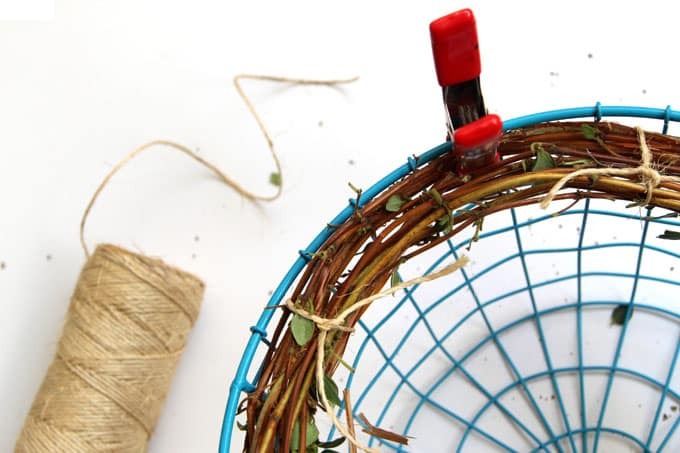 Continue bending pieces of vines around the circle and clamping them to the basket. Once you reached about 2″ to 3″ thickness, tie the bundle of vines with jute twine. 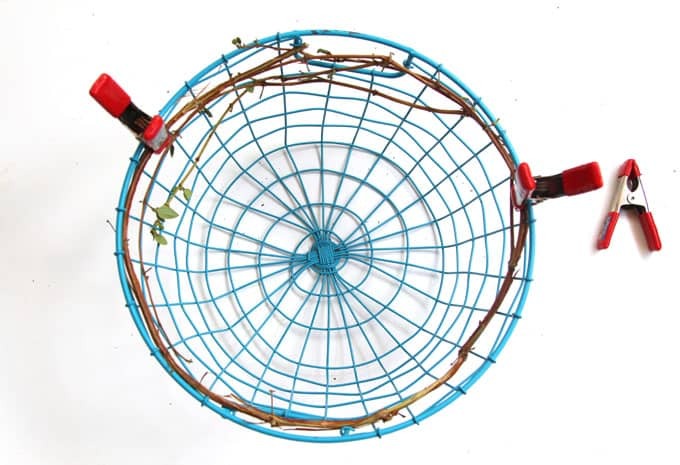 Make a knot around only the vines, not the basket! Six to eight spots around the circle would be enough. 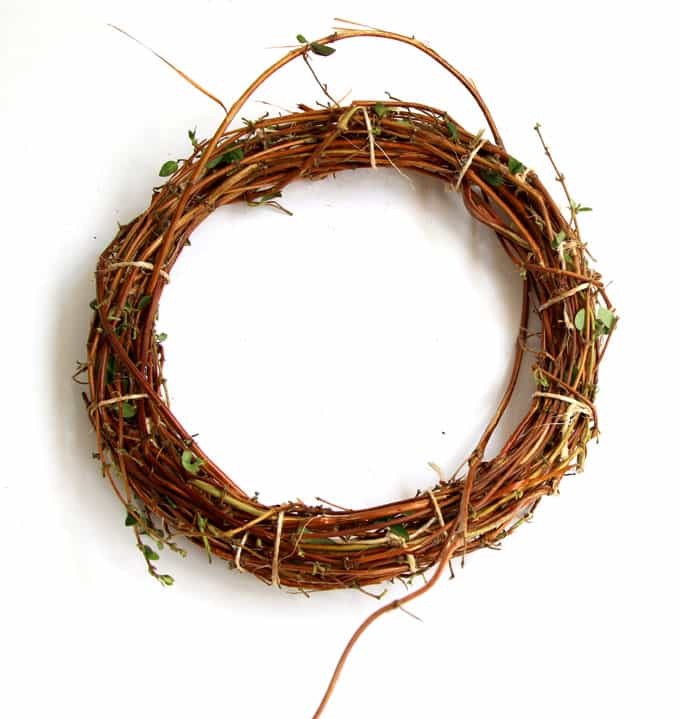 Slip the vine wreath out of the basket, and wrap a few sections of vine around the wreath as shown below. Tuck the beginning and ends in between the vines. You can now cut off the jute twine and the vine wreath will hold its shape. If you are patient, wait a few days to cut the twine off. 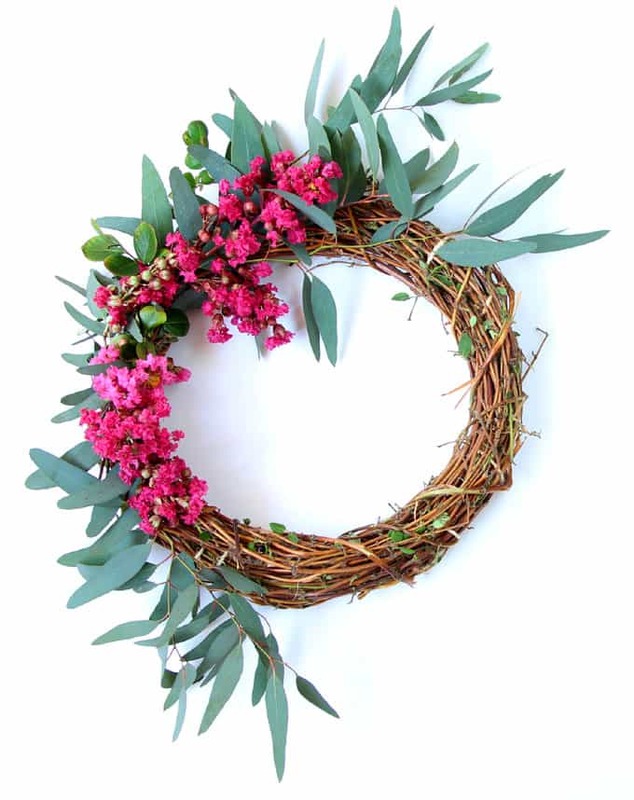 Having a honeysuckle or grapevine wreath as a base, it is so quick and easy to make wreaths from just a handful of botanical cuttings! I found some Eucalyptus tree leaves, red Pyracantha berries and pink Crape Myrtle flowers. Tied them to the vine wreath with clear fishing lines. Voila! These wreaths take only a few minutes to put together. Aren’t they so happy and pretty?! Here is the original Dollar store hack wreath making tutorial if you want to check it out! 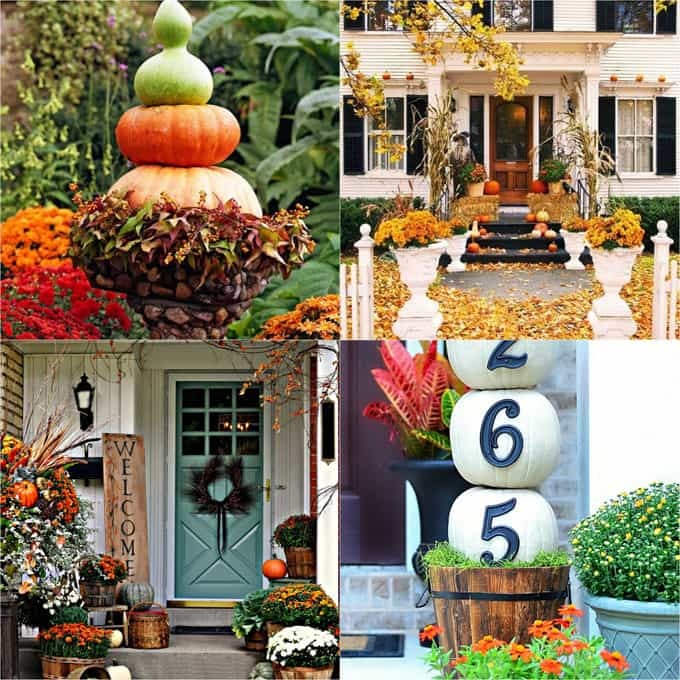 And 25 glorious fall front porch ideas here! Wow, your wreath turned out beautifully. I never would have thought I’d be able to do something like this because it always seemed way too hard. Thanks to your tips I think I might be able to handle it! Happy Fall! 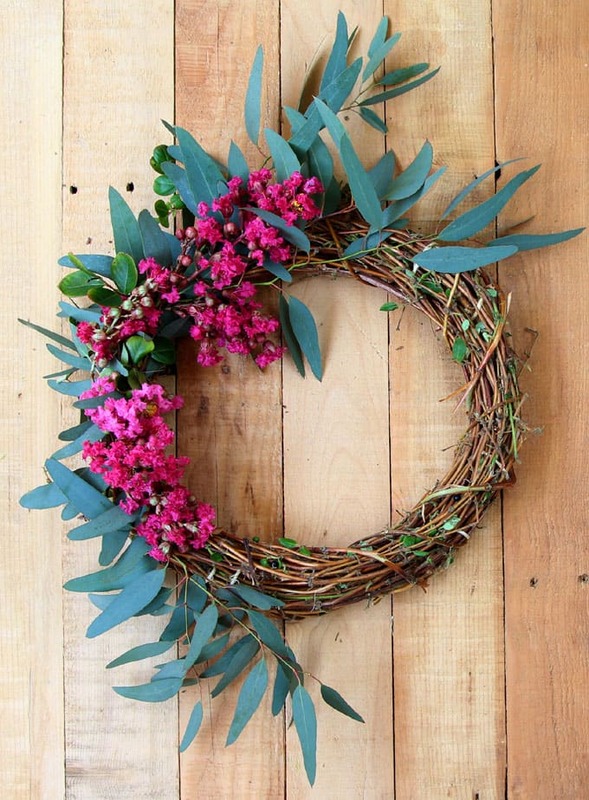 Love how you made your own grapevine wreath and added all natural!! Thank’s and take care of you..
Love this post! The addition of the natural findings from a nature walk is such a nice touch. 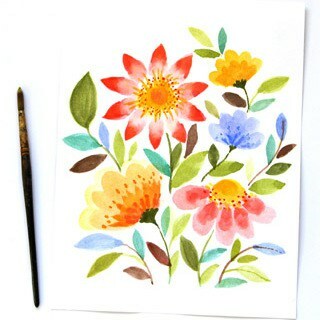 Adding this to my to do list! This is such a great idea! 🙂 And so pretty too! Your wreaths are GORGEOUS (and I just love those pumpkins, too)! This seems like an easy-to-follow DIY that just about anyone can do! Thanks! 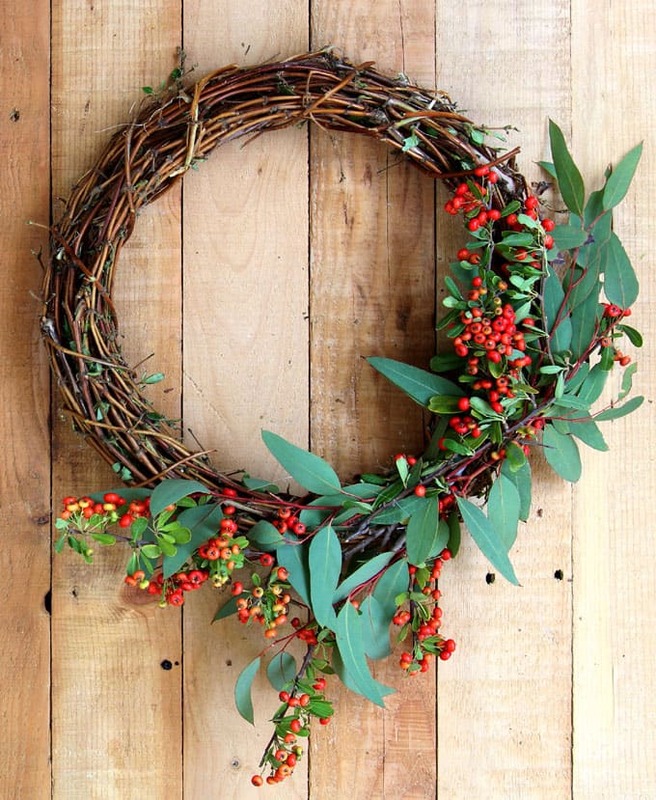 I adore all of your wreathes – pinned it!